Discussions on the energy transition usually focus on the economics of renewables and cost comparisons with fossil fuels and other energy sources. What is usually ignored, are innovations in materials and chemical processes, which are nonetheless increasingly important as agents of change in the energy sector. Innovation watcher Denis Kuznetsov discusses four scientific breakthroughs in materials research that could shake up the energy sector in the years to come. Basic research has played and continues to play a central role in the evolution of the energy sector. Historically, fundamental science has driven the development of new, innovative technologies that triggered disruptive changes in industries, economies and societies. To achieve the goal of global transition to a sustainable and low-carbon energy system, we need new scientific advances, which will solve existing technological barriers in producing, storing and using clean energy. As science enters a new age based on the control of matter and energy at the electronic, atomic and molecular levels, it is likely the energy systems of the future – whether they tap sunlight, store electricity, or make fuel from splitting water or reducing carbon dioxide – will revolve around materials and chemical changes that convert energy from one form to another. In this context I would like to discuss four scientific breakthroughs, which may well lead to applications with a large and disruptive impact on today’s energy world. Researchers at MIT have developed a new device called an “artificial leaf” that can convert energy from sunlight to electrical energy or fuel, imitating the photosynthetic process of plants. This “artificial photosynthesis” could be described more accurately as the solar-powered electrolysis of water. The leaf is a silicon cell that uses energy from the sun to electrochemically split water into hydrogen and oxygen. The hydrogen is collected and can be either used as a fuel or stored in a fuel cell. Scientists hope that this technology could provide cheap and efficient energy, first and foremost to developing countries. Today, over 1.3 billion people lack access to electricity and 2.6 billion people lack clean cooking facilities. With a single leaf, a bottle of water and sunlight, people could have enough electricity to power a small house 24 hours a day. According to researchers, the leaf can generate 100 watts of electricity. Moreover, hydrogen is an important fuel in itself, with the potential to reduce our dependence on oil. The burning of hydrogen does not generate air pollution or greenhouse gases and if hydrogen could be procured safely and economically, it could be used to fuel the combustion engines of spacecraft, airplanes and vehicles. With a single artificial leaf, a bottle of water and sunlight, people could have enough electricity to power a small house 24 hours a day. Today, the cost of energy production using an artificial leaf is the main hurdle to its expansion. In 2012, the estimates of hydrogen production using an artificial leaf were US$6.50 (€4.80) per kilogram. It costs just US$2 (€1.5) to make a kilogram of hydrogen from fossil fuel. Yet researchers are persisting. Following on from the work of Professor Daniel Nocera at MIT in 2012 (who has since moved on to Harvard), the largest research programme dedicated to artificial leaves today is the Joint Center for Artificial Photosynthesis (JCAP) at Lawrence Berkeley National Laboratory in California. JCAP is funded by the US Department of Energy with US$122 million (€90 million) over five years. Its main goal is to develop a new cost-effective leaf using low-cost materials. JCAP has promised to deliver a working prototype by 2015. The phenomenon of superconductivity was discovered more than 100 years ago. Superconductors are materials that can conduct electricity with practically no resistance when cooled to extremely low temperatures, ranging from near absolute zero (-273°C) to liquid nitrogen temperatures (-196°C). In the 1960s, the first commercial applications of superconductivity were developed. Scientists at Westinghouse developed the first superconducting wire, an alloy of niobium and titanium (NbTi). Next, Brian D. Josephson theoretically predicted that electrical current would flow between two superconducting materials even when they are separated by a non-superconductor or insulator.This phenomenon is known as The Josephson Effect and has been applied to electronic devices such as the SQUID, an instrument capable of detecting even the most subtle of magnetic fields. SQUIDs are used in applications from magnetic resonance imaging (MRI) in medicine to earthquake prediction. New, advanced superconductors could bring tremendous changes to the entire energy infrastructure. Superconducting wires and tapes can carry 100 to 200 times more electric current than conventional wires. They can increase power transmission capability and grid reliability, reduce transmission losses and cost, enable the incorporation of renewable energy, and reduce greenhouse emissions. Despite the enormous success of these new materials, the real-world application of superconductors was restricted by the requirement to cool to very low temperatures using expensive liquid helium. Until, in the late 1980s, Alex Müller and Georg Bednorz at the IBM Research Laboratory in Rüschlikon, Switzerland, created a brittle ceramic compound that superconducted at temperatures high enough to be cooled by a common industrial refrigerant – liquid nitrogen (-196 C°). Since then, scientists have been searching for new materials that can function as superconductors at higher temperatures and can be mass produced. In 2013, an international group of researchers from the US and Europe made another leap forward by creating the first computer-designed superconductor. They developed a new iron tetraboride superconductor based on advanced electronic structure computations. Until that time, all superconducting materials had been discovered experimentally and often accidentally. This new approach opens up a whole new path to predicting and designing new superconducting materials. The development of new advanced superconductors could bring tremendous changes to the entire energy infrastructure. Superconducting wires and tapes can carry 100 to 200 times more electric current than conventional wires. Higher-performance and lower-cost superconductors would increase power transmission capability and grid reliability, reduce transmission losses and cost, enable the effective incorporation of renewable energy, and through that and greater efficiency, reduce greenhouse emissions. Superconductors could also increase the efficiency and performance of practically all electrical equipment and devices. Living organisms have been making exquisite inorganic materials for over 500 million years. They have a DNA sequence that codes for a protein sequence that makes them able to build and replicate different solid structures. For example, abalones produce proteins which combine with ions of calcium and carbonate in seawater. This provides the material for them to make two types of crystals, which they assemble into layers to create an immensely strong composite structure. An abalone has within its DNA the ability to code for the proteins needed to gather the materials to construct a shell. Inspired by this idea, Professor Angela Belcher and her colleagues at MIT decided back in 2009 to take different elements from the periodic table, find their corresponding DNA sequence and then code for corresponding protein sequences to build structures with certain properties. The scientists used a simple, benign virus. When a virus attacks a cell, it injects its genetic material inside. As a result, instead of performing its normal functions, the cell starts making copies of the virus. By inserting a specific gene into the virus, the researchers spurred the virus to produce a protein coat that binds with compounds such as cobalt oxides and iron phosphates. The scientists could then grow nanowires with these compounds, which they used in an electrode for a prototype lithium-ion bio-battery. The potential of this technology is immense. We could programme materials to build structures, at room temperature and room pressure, neither using nor releasing toxic materials back into the environment. In 2010, the researchers constructed a lithium-ion battery, similar to those used in millions of devices, but which uses genetically engineered viruses to create the negatively charged anode and positively charged cathode.The researchers improved the power performance of electrodes made from iron phosphate nanowires by finding a genetic sequence for a virus that favorably binds to carbon nanotubes, which are highly conducting. This new material could replace the costly, toxic electrodes used in lithium-ion batteries today. Belcher and her colleagues continue to experiment with different viruses, forcing them to interact with various compounds, to create new materials and catalysts that could be used in the field of clean energy, including solar PV, batteries technology and biofuels. The potential of this technology is immense. We could programme materials to build structures, at room temperature and room pressure, neither using nor releasing toxic materials back into the environment. Future applications could include cheaper and more efficient conductive materials, solar panels, energy storage and chemical catalysts. In simple terms, graphene is a thin layer of pure carbon. It is a one-atom thick packed layer of carbon atoms that are bound together in a hexagonal honeycomb lattice. This novel material has been the subject of an explosion of research since groundbreaking experiments less than ten years ago, recognized by the Nobel Prize in Physics awarded to Professor Andre Geim and Professor Konstantin Novoselov from The University of Manchester in 2010. Its special atomic arrangement gives graphene unique optical, thermal, mechanical and electrical properties. Graphene is the world’s strongest material. It is about 200 times stronger than steel. At the same time it is the thinnest and lightest material ever obtained. It is also very stretchable – you can stretch graphene up to 20% of its initial length. In addition, graphene is a great conductor: electrons can flow through it more easily than through even copper. It is also a perfect thermal conductor (> 5000 watts per meter per degree Kelvin). 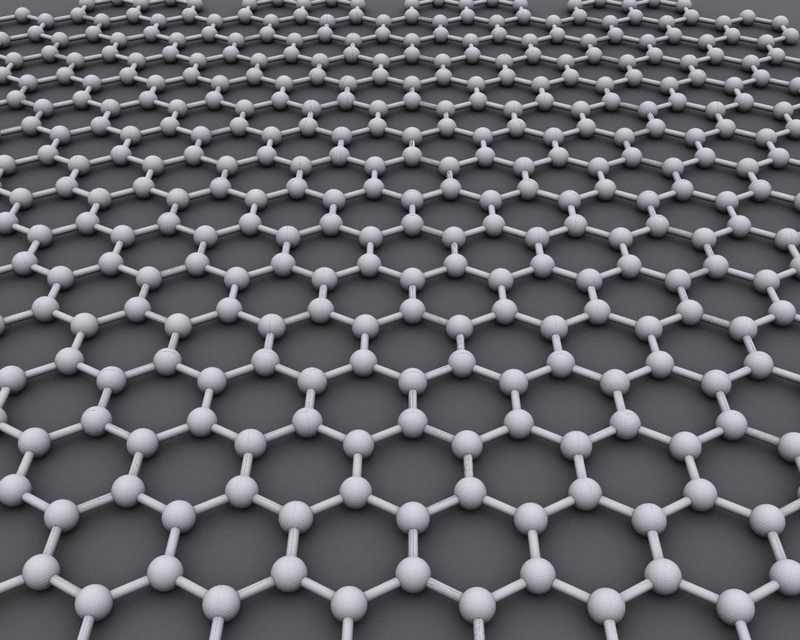 Despite being the thinnest material ever made, graphene is visible to the naked eye. Due to unique electronic properties, it absorbs a high 2.3% of light that passes through it, which is enough to see it in the air. And finally, as if all that is not enough: carbon is the fourth most abundant element in the universe. In 2013, the European Commission announced a €1 billion investment into graphene research and development for a period of 10 years, one of the largest-ever joint European research projects between academia and industry. Ever since it was discovered, graphene has been hailed as a natural wonder of the materials world, destined to transform a number of industries, including cleantech. Graphene can increase both the energy capacity and charge rate of rechargeable batteries. It can dramatically improve high-performance superconductors for energy storage. It may lead to a promising approach for making solar cells that are inexpensive, lightweight and flexible. Multifunctional graphene mats are promising substrates for catalytic systems and fuel cells. Graphene also shows potential in low-cost water filtration and desalination. It can be used in combination with other crystals for an almost limitless number of applications. While most Graphene Flagship partners are universities and research institutes, the share of companies – mainly SMEs – is increasing. In 2014, the project doubled the size of its network and about a third of the new partners are companies. The flagship now counts more than 140 organisations from 23 countries. It is difficult to make predictions about what specific applications these four scientific breakthroughs may lead to and what their impact will be. But it is clear that new materials and chemical processes will become game-changers in the energy sector. Moving from observational science to control science, gives us an unprecedented opportunity to build new materials that are not formed in nature. We can now design and synthesize new materials with amazing physical and chemical properties that can bring disruptive changes to industries including cleantech and sustainable energy. Denis Kuznetsov works at Carbovac, a promising French cleantech company, where he pilots international projects in hydrocarbon vapor recovery. He is also a founder and author of InnoDigest.com, a website dedicated to cleantech and sustainable energy technologies. Denis has a keen interest in breakthrough technologies, research projects and business development strategies that could potentially reshape our energy landscape.